THE S'MORES MARTINI for National S'mores Day! PLEASE SIR, I'D LIKE S'MORE! You know the old saying "Forget Love, I'd Rather Fall In Chocolate"? Well, the S'Mores Martini (or S'More Martini if you prefer the singular) is what I'd like to fall into. It has all the classic flavors of the campfire treat - chocolate, marshmallow and a graham cracker rim garnish. Get mini marshmallows, some votive candles and use the other half of the bamboo skewers from your martinis for your roasting sticks. Have your guests toast their own marshmallows over the candles for their martinis! 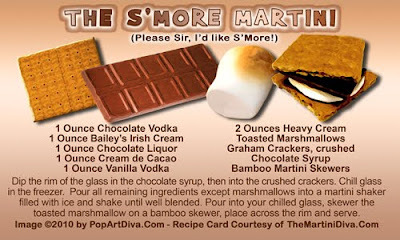 But make sure you keep the flames and the martinis far apart, the S'mores Martini is not a flaming drink! *Why are they called S'mores? Because after you eat one you want some more, of course.